The US President has proposed zero aid in 2018 to the Tibetans, reversing the decades-old American policy of providing financial assistance to the community for safeguarding their distinct identity. WASHINGTON: President Donald Trump has proposed zero aid in 2018 to the Tibetans, reversing the decades-old American policy of providing financial assistance to the community for safeguarding their distinct identity. The State Department, which sent the detailed proposal to the Congress as part of Trump's maiden annual budget, described it as one of the "tough choices" that it had to make as its budget itself has been slashed by more than 28 per cent. Leaders of the Tibetan community in the US refrained from making comment on the issue, saying they are still reading the budget papers. At the same time, they observed that majority of the assistance to the Tibetan people, including for Tibet, so far have been Congressionally driven. Democratic Leader Nancy Pelosi has expressed concern over the move. "Leader Pelosi is very concerned about the zeroing out of aid to the Tibetan community in the Trump budget proposal," Drew Hammill, spokesman for Pelosi, told PTI. The State Department, in its budgetary proposal for the fiscal year 2018 beginning October 1, have removed the decades-old Tibet Fund and has proposed zero dollars against Ngwang Choephel Fellows. Both the categories in 2017 and 2016 had accounted for more than a million dollars. However, the State Department in its footnote of the budget, said that Special Academic Exchanges, whose budgetary allocation has been reduced from more than USD 14.7 million in 2017 to just USD 7 million for 2018, would include funding for programmes such as the Benjamin A Gilman International Scholarship Program, Mobility (Disability) Exchanges, and the Tibet Fund. "As we work to streamline efforts to ensure efficiency and effectiveness of US taxpayers' dollars, we acknowledge that we have to prioritise and make some tough choices," a State Department official told PTI. "Focusing our efforts will allow us to advance our most important policy goals and national security interests, while ensuring that other donor countries contribute their fair share toward meeting global challenges," the official said requesting anonymity. 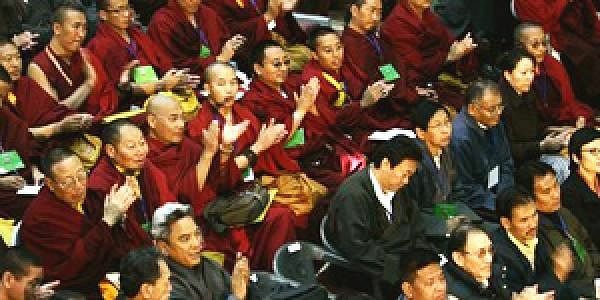 However, the official did not identify the countries that it would like to help continue funding for the Tibetan cause. "We will continue to engage diplomatically with allies and partners to advance our US national interests and shared policy priorities," the official said. Pelosi, who early this month led a high powered Congressional delegation to Dharamshala to meet the Dalai Lama, has expressed concern over the development. "As she has said many times, including during her visit this month to His Holiness The Dalai Lama in Dharamshala, if the US does not speak out for human rights in China, we lose all moral authority to talk about it elsewhere in the world," Hammill told PTI. "That includes critical funding through the State Department for important efforts, like those in support of a genuinely autonomous Tibet, that advance and protect America's interests in the world," Hammill said in response to a question. The move to abolish Tibet fund is expected to be widely opposed in the Congress. The US policy towards Tibet is currently driven by the Tibetan Policy Act of 2002 which was signed by the last Republican President George W Bush. Enacted into law on September 30, 2002, as part of the Foreign Relations Authorisation Act, FY2003, it lists its "purpose" as being "to support the aspirations of the Tibetan people to safeguard their distinct identity." The act establishes in statute the State Department position of United States Special Coordinator for Tibetan Issues and states that the Special Coordinator's "central objective" is "to promote substantive dialogue between the Government of the People's Republic of China and the Dalai Lama or his representatives." The Act, among other things, includes US government assistance for non-governmental organisations to work in Tibetan communities in China; an educational and cultural exchange program with "the people of Tibet"; Voice of America and Radio Free Asia Tibetan-language broadcasting into Tibet; and assistance for Tibetan refugees in South Asia. It also calls for a scholarship program for Tibetans living outside Tibet; and the National Endowment for Democracy (NED)human rights and democracy programmes relating to Tibet. The Special Coordinator is also required to "vigorously promote the policy of seeking to protect the distinct religious, cultural, linguistic, and national identity of Tibet" and press for "improved respect for human rights," according to a 2015 report on Tibet by the Congressional Research Service (CRS). It was in 2002 that the Congress began earmarking Economic Support Fund assistance to Tibetan communities in China. In addition to this the US Agency for International Development (USAID) manages provision of this support out of its India office.